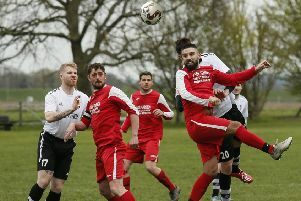 A week of cup football got off to a poor start for Ampthill Town when they were second best to Kempston Rovers on Tuesday and suffered a 3-0 away defeat in the North Beds Charity cup. Town were slow to start against the in-form UCL Premier outfit and two first half goals and another late strike sealed their exit. Dom Marsala put Ampthill on the back foot when he fired home the first goal inside five minutes as Town found the going tough in the early stages. Jamaine Ivy extended the lead midway through the first half when he robbed the Town defence in midfield and finished well. Ampthill came into the game more after the break but still did not do too much to test the home defence, with Dillon and Dummett both having shots blocked. Jack Ambler was in top form with some good stops while Joe McCabe twice made goalline clearances with the goal under siege. Marsala added the third seven minutes from time to seal Kempston’s place in the last four, although Town’s cause was not helped by an early injury to Danny Butler. Ampthill’s second cup game of the week is a Beds Senior Trophy quarter-final against near neighbours Flitwick Town. It is the first clash between the clubs for decades and promises to be a good match against the Bedfordshire League side. Ampthill’s home form has been good until their last match when they lost in the Division One Cup against Broadfields and they will be looking to get back to winning ways. There is another midweek cup trip for Ampthill next week when they go to Berkhamsted in the Challenge Trophy. Berko are in the Premier Division so Ampthill will need to compete with them after wins over Tring Corinthians and Southall in previous rounds. Ampthill were left kicking their heels again on Saturday when Crawley Green’s Barton base was deemed unfit at midday because of recent rain and was the only SML game called off that day.